You can set up call forwarding and simultaneously ring so calls don’t get missed. 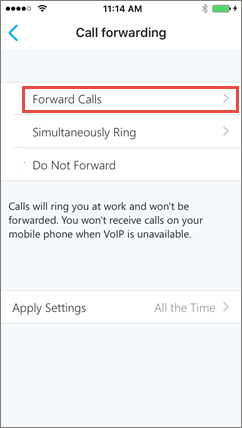 You forward incoming calls by setting up forwarding rules. Call forwarding options are available only if your organization is configured to support them. If you’re not sure about which Skype for Business features are enabled, contact your organization’s technical support team. If call forwarding options are enabled, you can forward calls to another number or to another contact. Call forwarding is especially useful if you’re traveling or working from home because calls can be forwarded to your current location. If you’re out of the office, calls can be automatically forwarded to a coworker. The simultaneously ring option is handy for people on the go. When you get a call, it rings on two phone numbers at the same time. You can set your incoming calls to simultaneously ring your phone and another number or contact in case you’re busy or momentarily unavailable. The Call Forwarding option is typically used to forward calls to voice mail or to a number other than your mobile number. 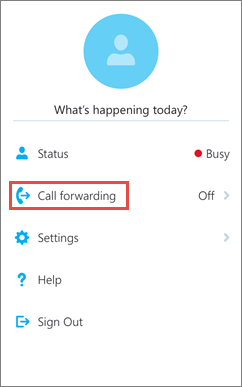 When you set call forwarding settings in Skype for Business, all incoming calls are automatically forwarded to the destination you choose. Tap your picture, and then tap Call forwarding. Tap the arrow next to Forward Calls. Tap Voice mail to have the call sent to your voice mail where you can retrieve it later. Click New Number, and type in a new phone number. Tap New Contact, and then search a contact in the dialog box that is displayed. (Optional) Tap Apply Settings, and then select when this setting should apply. Tap your picture, tap Call forwarding, and then tap Do Not Forward. Unlike call forwarding where your work phone doesn’t ring, you can set your incoming calls to simultaneously ring your phone and another number or contact. This setting can help ensure that callers don’t get the busy signal and their calls don’t get missed. At the same time, they won’t be aware that their call was forwarded. Tap your picture, tap Call forwarding, and then tap the arrow next to Simultaneously Ring. On the Select Number screen, tap New Number, type in a new phone number, and then tap Done. 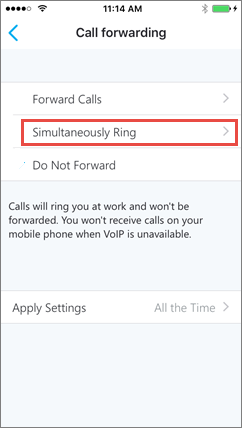 If the Call Forwarding option isn’t set to Simultaneously Ring on your mobile phone, you won’t receive incoming Skype for Business calls on your mobile phone when Voice over IP isn’t available.